Amid a major lapse by the Guyana Geology and Mines Commission (GGMC) to award contracts for repair and maintenance of several interior roads in a timely manner, the Ministry of Public Infrastructure will next year take back responsibility for such works, Junior Public Infrastructure Minister Annette Ferguson announced Thursday night. In contributing to debate on an opposition-sponsored motion on the state of the key road arteries to interior locations, she said Cabinet on 24th November, 2017 had decided to transfer responsibility from the Ministry of Public Infrastructure, but the contracts were not awarded until May 15, 2018. “MOPI will undertake full responsibility for the funding and execution of routine maintenance in advance of the wet, rainy season from June 2019,” she said. Government has been told that maintenance of the roads could not be left to large forest concessionaires. Ferguson said her ministry would be using chemicals to prevent erosion and destruction of the road. “MOPI will prioritise the use of chemical stabilisation in fair weather road construction to ensure that our primary corridors have greater climate resilience,” she said. 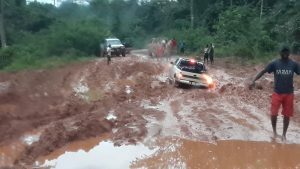 A United Kingdom-funded initiative to construct part of the Linden-Lethem road is currently being evaluated and the feasibility studies are being reviewed. Similar talks are underway with Brazil for another section of that corridor. The Junior Infrastructure Minister’s restatement that several contracts have been awarded to a number of contractors to conduct repairs and maintenance did not go down well with opposition People’s Progressive Party (PPP) parliamentarian, Alister Charlie. “The minister intends to blame the rains for the deplorable state of the hinterland road- blame it on the rain- but remember, Mr. Speaker, in every year we have two budgets. Budget 2018 was read in 2017 which gives time for road maintenance in the hinterland regions. It is unacceptable now in this House for the Honourable Minister to mention that awards had been given out to execute works in the middle of the rainy season,” said Region Nine parliamentarian, Alister Charlie. Senior Minister of Public Infrastructure, David Patterson noted that laterite, which is used to maintain the roads, is “very susceptible to water and can be easily compromised to heavy rainfall.” Against that background, he noted that in 2014, 2015, 2016 and 2017 laterite was being stockpiled on the roadways to ensure the material is readily available for “quick intervention”. PPP frontbencher, Gail Teixeira, in kicking off debate on her motion, assailed government for contributing to a significant decline in foreign exchange from gold, diamonds and timber because of the poor state of interior roads. She noted that the bad condition of the roads was highlighted in government’s own economic reports as one of the reasons for a decline in revenue. “The problem now is that your economy is in trouble and it’s the economy which is dependent on those same goods on those same roads to come out to the coast,” she added. In recent weeks, trucks and other vehicles have toppled on their journey to and from Lethem. A one-way trip now takes as much as three days in contrast to 11 hours when the road was in good condition. The Guyana Manufacturing and Services Association (GMSA) has expressed concern about the adverse impact of the poor condition of roads on the timber sector including temporary layoffs, loss of revenue and markets.